Amazon has a great deal on Otterbox Case for iPhone 4S – Black. You can grab one for only $13.50 SHIPPED! Thanks MyLitter and Swaggrabber! Otterbox Commuter Case compatible with iPhone 4 & 4S (AT&T, Verizon & Sprint). Cutouts allow for access to all buttons and features. Silicone plugs provide coverage for ports. Made from durable silicone skin and a high-quality polycarbonate outer shell. Case provides added protection against bump and shock. This case is NOT protective against water. Calling the Lego Lovers! 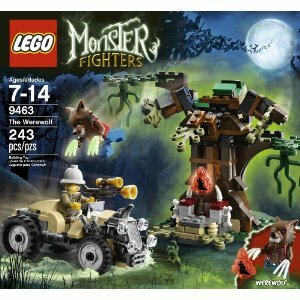 Get a Lego’s Monster Fighter set from Amazon for only $12.99 + free shipping with super saver shipping. You could add this one to your gift closet! Thanks DealsintheMitten! Watch out for the Werewolf’s glow-in-the-dark claws. Rosetta Stone Software 35% off today! Heads up! 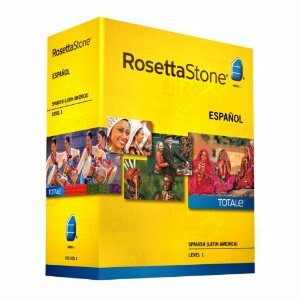 Today on Amazon, the deal of the day is for 35% off the Rosetta Stone software. These programs are normally $179, today they are $116 with free shipping! Save on Rosetta Stone Level 1 software titles. With Rosetta Stone, recreate the natural way you learned your first language and reveal skills that you already have using Dynamic Immersion. This award-winning method has been adopted by countless organizations, schools and millions of users around the world. Offer valid today only, February 1, 2013. Amazon has Presto SaladShooter Electric Slicer/Shredder for only $30.99 (was $49.99) & eligible for FREE Super Saver Shipping. This is one of our favorite appliances. If you are eating healthier this is one of the best products out there. In the time it takes to get the knife out, you can have a bag of carrots sliced up and ready to go. Quickly slices or shreds vegetables, fruits, cheese, and more for sensational salads, perfect pizzas, terrific tacos and delicious desserts. Takes the work and mess out of making salads – one ingredient after another shoots right into your salad so there are no extra bowls to clean! Extra easy to use – interchangeable slicing and shredding cones slip right in. No complicated parts to assemble.Quickly slices or shreds large amounts of vegetables, fruits and cheese. Get Your Free Kindle Download of the Drew Brees eBook! Ok I am not going to lie, I have already downloaded this book! 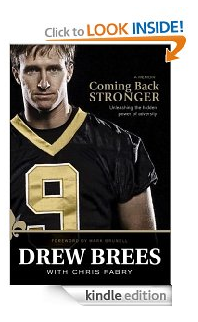 You can get the Drew Brees book, Coming Back Stronger for FREE today on Amazon! I am a huge Drew Brees fan, what he came back from and has accomplished is nothing short of amazing! Go HERE to get this book! See Tiffany’s HUGE list of FREE eBooks HERE. When a potentially career-ending shoulder injury left quarterback Drew Brees without a team—and facing the daunting task of having to learn to throw a football all over again—coaches around the NFL wondered, Will he ever come back? After Hurricane Katrina devastated New Orleans, leaving more than 80 percent of the city underwater, many wondered, Will the city ever come back? Brees’s inspiring message of hope and encouragement proves that with enough faith, determination, and heart, you can overcome any obstacle life throws your way and not only come back, but come back stronger. Remember that you do not have to have a Kindle to get all these awesome FREE e-books. You can read them on most of the devices that you already have! Go HERE to get the app! Are you planning something special for Valentine’s Day? Amazon has a great selection of Valentine’s Day Home & Kitchen items that will make anyone feel special. Looks like I might be whipping up some heart shaped waffles and eggs for the family. Amazon prices can change without notice, click HERE to see more great deals.